You can’t land a paraglider on the summit of Mont Blanc (15,781 feet) in July unless the cloudbase reaches about 16,000 feet, and that requires above-average temperatures. Paragliders rely on thermal convection currents to gain and maintain altitude, and July in the Alps is rarely warm enough to get the job done. But this year was different. 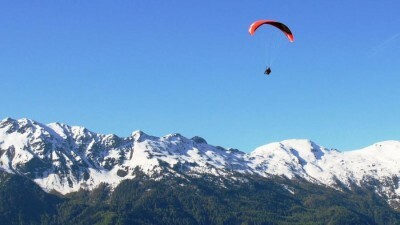 During the first week of July, temperatures in Chamonix, France, probably the most popular place in the world to paraglide, lingered in the mid 80s, about five degrees warmer than average. Hundreds of paragliders flew near, over, and around Mont Blanc during the weekend of July 4, and several were able to top-land on the summit. So many paragliders were circling the mountain at one point that a search-and-rescue helicopter couldn’t reach a crash victim for fear of colliding with a glider.